Welcome to Blocked City. Population: you. And the rest of us writers. This place is very busy!!! You may have heard that ‘there’s no such thing’ as Writer’s Block. I beg to differ. 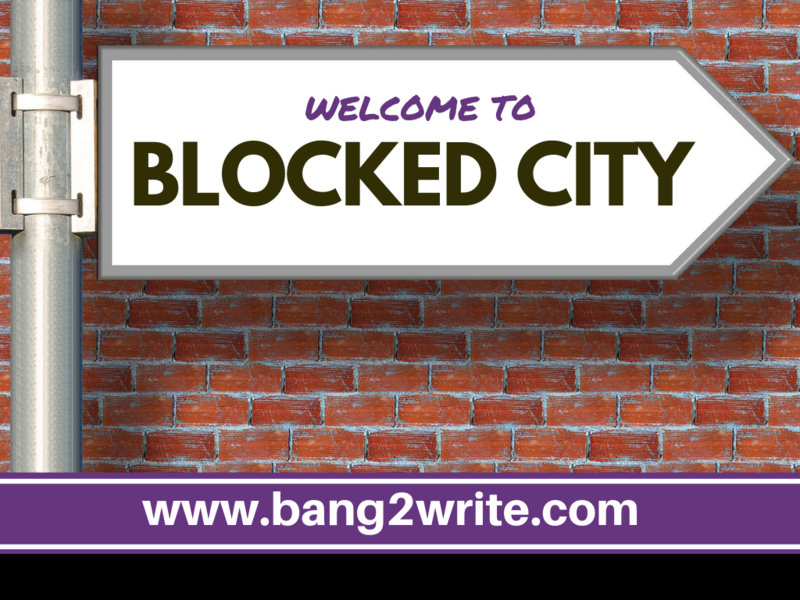 I hear from Bang2writers all the time about how they feel blocked … And if that is how they feel, then it’s real to them! I have also felt the anxiety and pressure of deadlines, which in turn has made me feel less creative. It can be a vicious circle. This is why I like the infographic below, which puts the whole problem under the microscope and considers WHY writers feel blocked. This got me thinking about my top tips for getting out of Blocked City, which I managed to narrow down to 3 main tips below. There’s also a bunch of linkage to help you blast through as well. Good luck! Most writers get blocked because they are attempting to write with only a portion of the story in their head. This means as soon as they come across an issue, they get stuck in what I call ‘The Story Swamp’. An outline is like a map, helping you get out again. It doesn’t have to be mega-detailed! Your story map could be index cards or post-its, or just bullet points. It could even be a drawing. Just as long as you have that ‘story map’, you are far less likely to get stuck. Writers often don’t have enough time to write … So when they finally get to sit down in front of their computer, they ‘can’t’ write. This is due to putting so much pressure on themselves. The worst thing you can do is sit there in front of ther screen, freaking out. Turn off the computer, go for a walk, reflect on WHY you feel so anxious, down, or not confident about writing. Think about the interventions you can put in place to stop this happening. Instead of writing only at specific times, perhaps keeping a notebook handy and writing in five-minute bursts longhand would help (or vice versa!). Perhaps explaining to your partner and getting them on board with your dream would help. Whatever it is stopping you, deep down, work out what it is and what you can do about it. There’s always something. If you don’t believe you can do this, no one will. When you feel blocked, tell yourself – YOU GOT THIS. Then what do you know … It will come true! GOGOGO.